Are You Thinking of Removing that Tattoo? When you first had that tattoo put on you were more than happy to show it off. But as the years have worn on you find yourself regretting that decision. Perhaps your tattoo has faded or blurred with age, or maybe your tastes have changed and it no longer appeals to you. Whatever the case, you are not alone. It is estimated that nearly 50 percent of those who get a tattoo regret it at some later point in their life. An entire industry has risen as a result. Tattoos are meant to be permanent, but with the current technology available today, many have successfully removed tattoos that they no longer want. However, the process can be expensive and the results are not guaranteed. 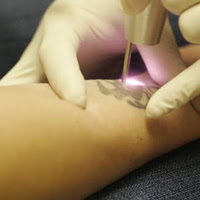 But if you are still contemplating the procedure, read on to see what sort of tattoo removal techniques and treatments are available. You may have already tried one of the many tattoo removal creams available on the market. These creams are usually ineffective. At best they may lighten the tattoo. Consult a dermatologist if you are serious about removing a tattoo. Tattoo removal is typically done as an outpatient procedure. Below are three of the most common techniques for removing tattoos. Lasers, specifically Q-switched lasers, are the most preferred means of removing tattoos. The laser emits energy in a single pulse onto the ink layer just under the first layer of skin. The heat breaks down the ink which, over time, is absorbed and removed by the body’s immune system. The entire session may last only a few minutes. Before treatment, the skin is numbed with a local anesthetic. After treatment, you can expect some swelling, blistering, or bleeding. Antibacterial ointment, provided by your doctor or picked up at a medical supply store, can help ensure the treated area heals without infection. Multiple treatments are typically required to progressively lighten the tattoo over time. This process begins with the skin being chilled until it is numb. Then the tattooed skin is essentially sanded away with a high speed rotary brush. With much of the top layer of skin gone, the tattoo ink then may leach out of the skin over a period of time. As you may expect, the treated area will likely feel sore and raw for a week or more. Using antibacterial ointment will help promote healing and a light bandage will help protect the area. This treatment totally removes the tattoo but will leave scarring. The area is numbed with an injection and the tattoo is removed with a scalpel. The edges of skin are then stitched together. This removal technique is most practical for small tattoos. Most dermatologists agree that complete tattoo removal isn’t possible. Many factors help determine the outcome. The remaining blemishes or other skin variations depends upon the size and location of the tattoo, in addition to other factors including the age of the tattoo and the individual’s ability to heal. Frank Nielson is a retired medical researcher who now spends his days writing. Through this means, he is always looking to help consumers find the best medical supplies at a competitive price.